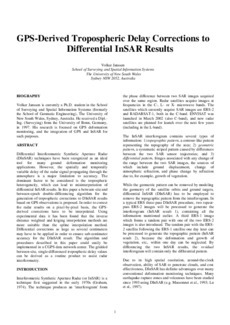 Differential Interferometric Synthetic Aperture Radar (DInSAR) techniques have been recognized as an ideal tool for many ground deformation monitoring applications. However, the spatially and temporally variable delay of the radar signal propagating through the atmosphere is a major limitation to accuracy. The dominant factor to be considered is the tropospheric heterogeneity, which can lead to misinterpretation of differential InSAR results. In this paper a between-site and between-epoch double-differencing algorithm for the generation of tropospheric corrections to DInSAR results based on GPS observations is proposed. In order to correct the radar results on a pixel-by-pixel basis, the GPSderived corrections have to be interpolated. Using experimental data it has been found that the inverse distance weighted and kriging interpolation methods are more suitable than the spline interpolation method. Differential corrections as large as several centimeters may have to be applied in order to ensure sub-centimeter accuracy for the DInSAR result. The algorithm and procedures described in this paper could easily be implemented in a CGPS data network center. The gridded between-site, single-differenced tropospheric delay values can be derived as a routine product to assist radar interferometry.